Munish Resorts is a delightful Hill-Top Resort which is far from the noisy town and is located in the centre of the lush green surroundings, as well as the dotted green lawns with colorful flowers that blooms. It is a family-managed Resort that is constructed in the year 1992, where you can find the personalized care and service of the guests, with the unique feature of the Munish Resorts. This gives a good pleasure and satisfaction when guests come repeatedly. The place is best to reside overnight, and is situated on the way to Manali from Delhi. Several facilities have been provided in the Munish Resorts which consists of the Multi-Cuisine 'Ekant Restaurant' that serves Indian, Chinese and Gujarati food on order. Also, there is a Multi-purpose hall with a capacity of 250 guests where there is a Personalized Service, as well as the Internet facility (Wi-Fi Campus), which helps customers to make payment through all the major credit cards, along with a large area for parking, healthcare (doctors), laundry, as well as the Travel Desk, Car on Rentals, etc. are available with two spacious lush green lawns, where Resort is surrounded by the Mango and Litchi, Pears and Papaya, Gauva, as well as different fruit plants. There is also a Kitchen Garden with Organic vegetables grown for the guests. There is a 100% advance made by way of Demand Draft through SBI of Mandi in favour of Munish Resorts. You may also deposit your check or cash at any bank branches of SBI, HDFC Bank or ICICI bank only after the confirmation of the availability of the Room. The HDFC or ICICI bank A/C number can be collected from the hotel via the mobile number given in their website; and if you cancel, 50% of the refund will be done in 15 days, else no refund. The only thing that matters is to impress the guests in the hotel's large balconies along with the attached Rooms that dominate the mountains and valleys. Also, there are certain rooms which have spacious cleaned bathrooms with the instant hot water. One can get the benefits of both A/C and non-A/C Rooms, with many facilities which comprises the good and healthy food. Wherein, Guests are free to choose the standard Non AC Rooms, a Semi-Deluxe Non AC Rooms, as well as the Deluxe AC and Super-Deluxe AC Rooms. All these Rooms have the basic amenities like Telephone, Color Television, and furniture to have dinner comfortably. Thus, Stay at Munish Resort is always bright and comfortable with updated facilities that makes the stay memorable. 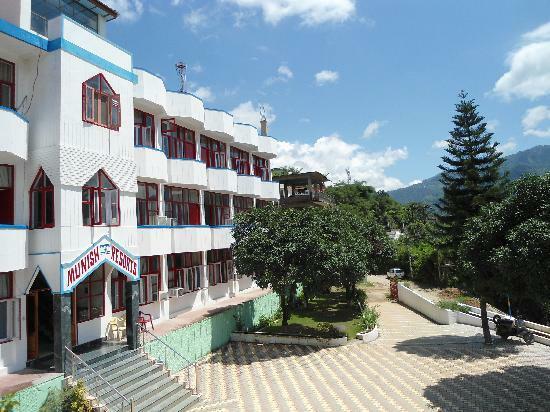 Apart from all the amenities provided in the Room, one can also enjoy the excellent panoramic view of the rambling Beas and hills right over the balconies creates an a wonderful atmosphere.